Since the age of four, Ava has loved following her curiosity for learning violin. A native of Northern Minnesota, she has been active in her hometown Lakes Area Music Festival as a featured chamber musician since 2011, and as a soloist in the 2018 season. In high school, her performance highlights included soloing with the Heartland Symphony Orchestra, touring Cuba with Minnesota Youth Symphonies, and placing as a top prize winner with her quartet in the Saint Paul Chamber Orchestra Youth Chamber Music Competition. She credits her mentors and teachers in the Minnesota Orchestra, as well as inspiring coachings from groups such as the Calidore String Quartet, for her continued development. 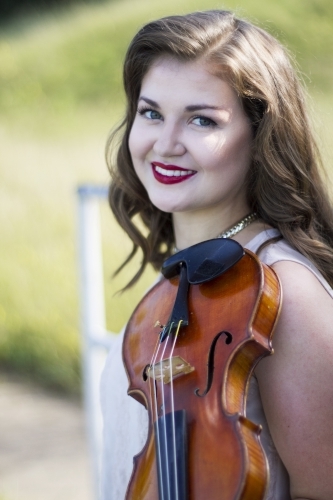 This fall Ava will be a junior at Boston University, in the studio of Bayla Keyes, and has enjoyed studying chamber music under the coaching of the Muir String Quartet and numerous Boston Symphony Orchestra musicians. She has also appreciated the orchestral experience of performing under the baton of Bramwell Tovey in the Boston University Symphony Orchestra.